We now know that whistles have been used for thousands of years. We can imagine from the readings and stories of the times what they looked like. All photos are Courtesy of the Portable Antiquities Scheme from the London Museum. We are including on our site some interesting whistles that they've found in some of their escavations. Some are hundreds of years old! 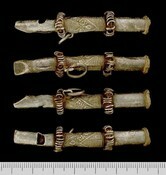 Incomplete silver huntsman's whistle of Post Medieval date, probably early sixteenth century.